A variant of snuffers with tray, in which the snuffers fit vertically into a stand, was produced circa 1680-1725. It is rare to find both the stand and snuffers of such an early date remaining ensuite and marked by the same maker, as they were typically manufactured by different craftsmen. It is extremely unusual for the stand to incorporate a candle socket. Three examples of this rare form with conical extinguisher are now in the Manchester City Art Gallery. One of these, dating to 1688, shares the same maker's mark as the present snuffers and stand, WB mullet below; its stand bears a great resemblance to the present lot. However, only the stand, which features a detachable candlearm, is marked. 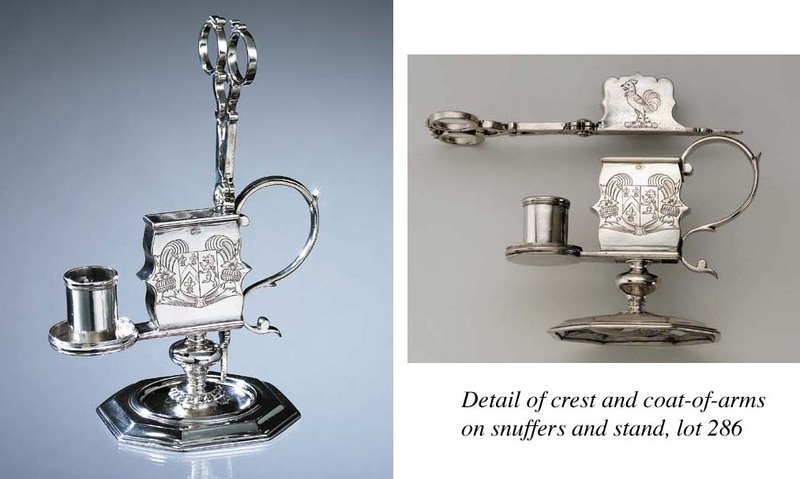 Of the two remaining sets in the Manchester collection, only one dating to 1697 features elements marked by the same silversmith, John Bernard (see J. F. Hayward "English Silver in the Collection of Mr. and Mrs. Edgar Assheton Bennett," Connoisseur, June 1956, p. 223-28).